Op-amp (Operational Amplifier) is very important component in Electronics, and used in many Electronics circuits to serve different purposes. We have used different Op-amps in many circuits and developed a separated section for Op-amp Circuits. Op-amp basically has Voltage Comparator inside, which has two inputs, one is inverting input and second is non-inverting input. When voltage at non-inverting input (+) is higher than the voltage at inverting input (-), then the output of comparator is High. And if the voltage of inverting input (-) is Higher than non-inverting end (+), then output is LOW. Op-amps have large gain and usually used as Voltage Amplifier. Some Op-amps have more than one comparator inside (op-amp LM358 has two, LM324 has four) and some have just one comparator like LM741. 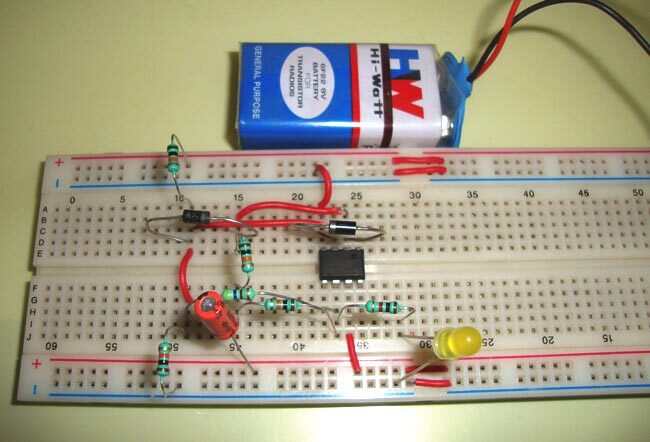 Circuit is very simple and we have kept is simple with few components, which can be easily built on breadboard or on PCB. We just need to place the op-amp LM741 on right place and if the Op-amp is in good condition then LED will flash or Blinks, and if Op-amp is faulty then either LED will remain ON or OFF continuously. Working of the circuit is simple, basically this circuit generates a Square wave at the output if op-amp is in working condition, resulting a Blinking LED. When we ON the circuit with op-amp is in place, initially voltage at non-inverting input (+) is higher than the voltage at inverting input (-) and output of op-amp LM741 (PIN 6) is High. So capacitor C1 starts charging through the resistor R6, when C1 charging exceeds the voltage at inverting terminal (PIN 2), then output becomes low. And when the output goes Low, capacitor C1 starts discharging and again voltage at inverting terminal of comparator becomes lower than non-inverting terminal and output goes High. 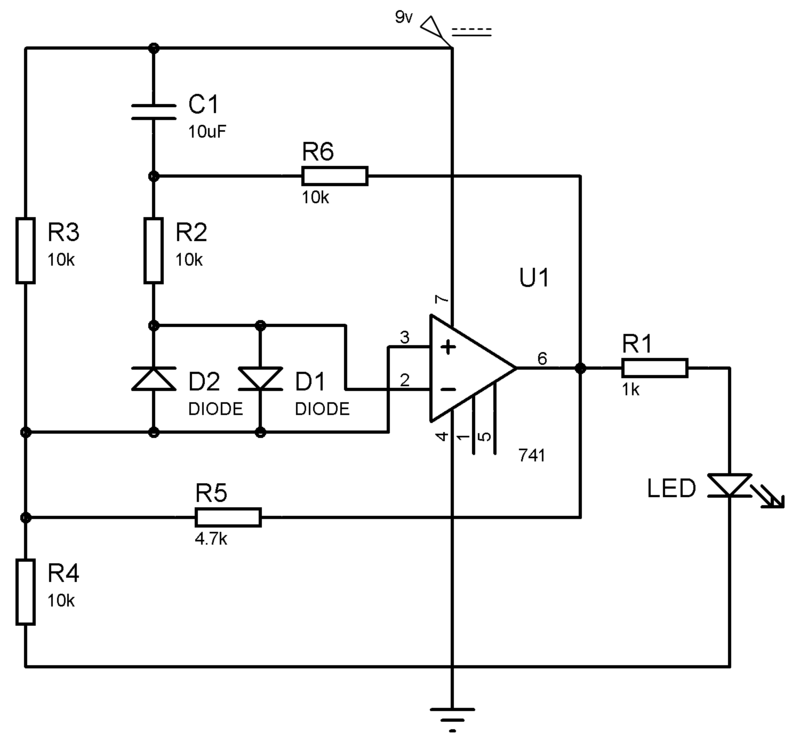 This process repeats continuously and produces Square Wave at the output, which causes LED to Blink. So if the Op-amp is in working condition, then LED will blink continuously at regular interval and if op-amp is faulty then LED will either stays ON or OFF. This process of charging and discharging of capacitor is much similar to 555 timer IC in Astable mode, which also produces square wave at the output. Adapted this circuit for one amp of common dual opamps used today LM358, TL072 NE5532 (by swapping connections from pin 6 to pin 1 and supply pin from pin 7 to 8). It works well. I do think there is perhaps a minor error on the schematic as no joint (black dot) is shown from R4 to Ground (to from the voltage divider) or from LED cathode to ground. Anyway, thanks for the schematic. what is the role of the diodes in the circuit? The circuit works fine without the diodes. My led is continuously remain ON for good IC and remain OFF for burned ic..
hey i have the same problem. Did you solved it? The led light wont blink. I dont know what is the possible connection that I missed. in trying to create a transimpedance amplifier for a lifi internet receiver,what kind of operational amplifier (op amp) or integrated circuit (IC) is best for this amplifier. Sir,is it a must i use the arduino circuit board because i feel is a restriction since it allows for maximum voltage output of 5volts? Sir,does the arduino circuit board of a USB phone plug that goes to direct current have op amps in them? Sir,can the op amp be refered to as a COMPARATOR?